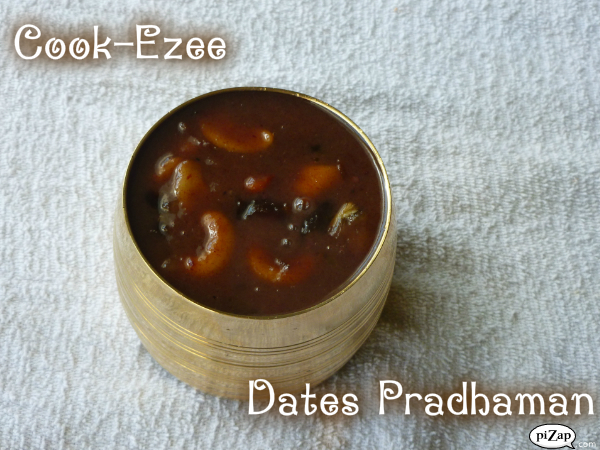 The idea of making Dates Pradhaman or Dates Payasam came out just because I was trying to finish of the leftover dates. My kids do not like to eat dates for some reason and I end up making Dates log all the time. I thought of making something else other than logs and end up making this payasam as I knew my son would love to have payasam anytime. Now then when I made up my mind to make payasam I was still debating whether to make it with Jaggery-Coconut milk or Milk-Sugar. I'm sure every Keralite have these two ways of making payasams, that is either with coconut milk and jaggery called 'Pradhaman' or Milk and Sugar called 'Payasam'. At the end Coconut milk-Jaggery mix won the debate since Pradhaman is my hubby and kids all time favorite. Try out this awesome payasam for this Onam and I'm sure you all will love it. Enjoy!!!! Soak the dates in water for 10 mins. Strain off the water to another vessel and keep aside for later use. Heat up a thick bottom pan with wide mouth(uruli preferably) and add 2 tsp ghee. Keep the flame in medium heat and saute the chopped dates for say 2-3 minutes. Add the thin coconut milk and the strained water to the dates and cook for 5-7 mins till everything boils and dates are cooked well. Keep stirring in between. Add the melted jaggery and stir well for 3-5 mins. Now add the thick coconut milk and cook in low-med heat for say 3-4 mins. Set aside. Heat up a small frying pan add 2 tbsp of ghee and roast cashews and raisins. Add them to the cooked pradhaman with the ghee. Spread the cardamom powder and mix everything well. Set aside to let it cool. Serve warm or chilled. You can garnish with few more chopped dates if desired. Enjoyy!!!!! 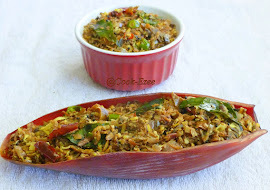 Hi there, thank you so much for dropping by and leaving a note on my recipes and posts. Your thoughts are really valuable, they are my energy boosters, so let them keep flowing. Browse around for more recipes, please feel free to leave your suggestions if any. Hope you enjoyed your stay at Cook-Ezee, visit us again!!!!!! Copyright © 2018. All rights reserved ® unless noted otherwise. The Contents and Images on this blog belong to Cook-Ezee.blogspot.com and may not be duplicated or published without author's written permission. 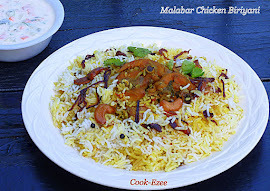 Copying or posting of any of the recipes and pictures without written permission on any other page/blog or article is strictly prohibited and will turn to plagiarism. Copyright © 2018 Cook-Ezee. All rights Reserved. A person who loves to lead a simple life, who some times laugh too much on silly things and beleives life comes with no guarantees. I'm a dedicated mother of two, a devoted wife, a darling daughter, a dear sister and a loving friend. As every human I would love to dance in the pouring rain, wake up seeing the beautiful sunrise but I rather beleive the best things in life are: Breath in your nostrils, light in your eyes, flowers at your feet, duties at your hand, the path of right just before you. Then do not grasp at the stars, but do life's plain, common work as it comes, certain that daily duties and daily bread are the sweetest things in life. ഗോതമ്പ് പായസം/Gothambu Payasam/Broken Wheat Payasam and Happy Vishu Wishes!!! Copyright © Cook-Ezee 2018. Awesome Inc. theme. Powered by Blogger.